This personalised notebook from Getting Personal would make a fab 1st Anniversary Gift or unusual Wedding Gift. 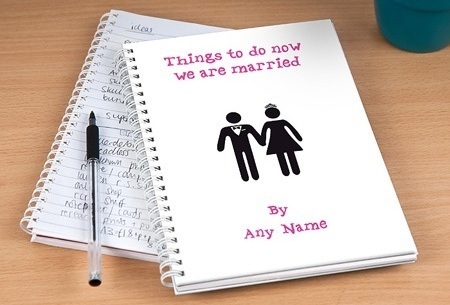 In the UK your First Anniversary Gift is traditionally paper & this ‘Things To Do Now We Are Married’ notebook is perfect, it can be customised with any name. Better still, save 15% when you pay for your Getting Personal order with PayPal and use code PPFIFTEEN at checkout! 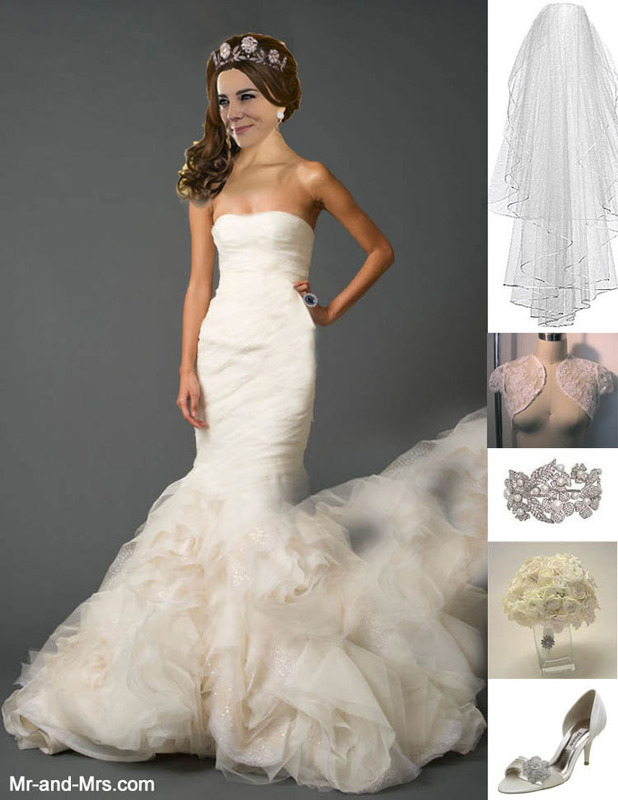 Speculation is mounting as to which designer Kate Middleton will choose to design her Wedding Dress. Many suspect our future Queen will enlist a British Couture House with what will be THE most iconic dress of the decade, many putting their money on Sarah Burton ~ who was the right hand woman of the late Alexander McQueen & now Creative Director of the McQueen label. Other possible designers are Bruce Oldfield, Vivienne Westwood, Jenny Packham, Ian Stuart, Sassi Holford or will Kate surprise us by giving a relatively unknown designer the most prestigious commission in British fashion? 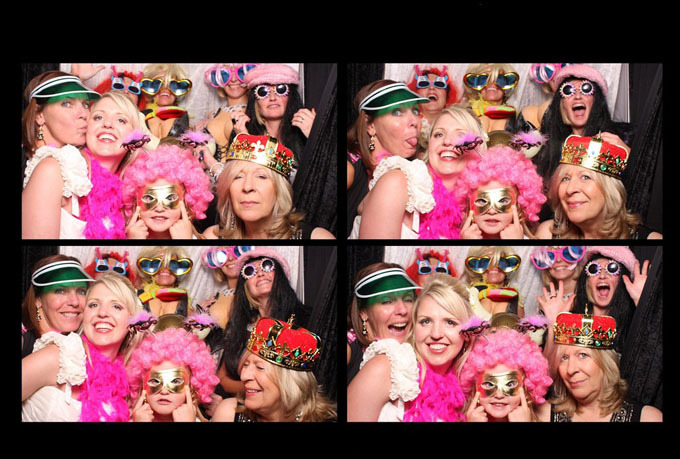 We may have to wait until the Royal Wedding Day on 29th April to find out, but we can have lots of fun talking about it before the big day! Kate is a beautiful woman and there is no doubt she will look elegant & every bit the Princess when she marries her real life Prince Charming. I am expecting a classic silhouette with modern fabrics & detailing, not too fussy but definately not plain (Wedding Gown above by Vera Wang). 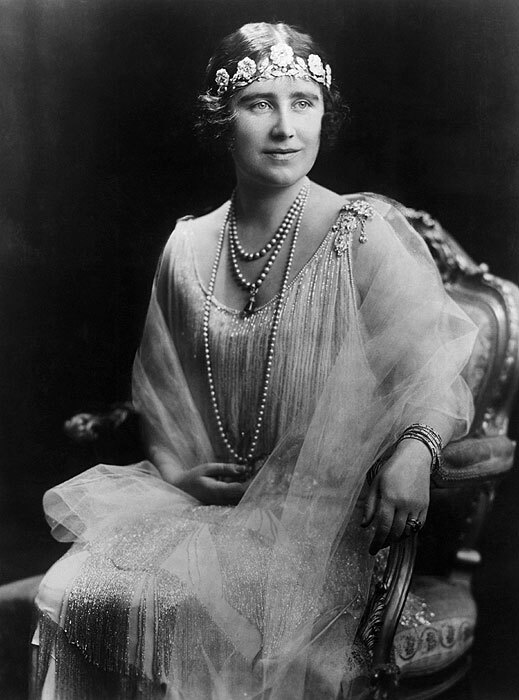 I would expect the Bride to wear one of the Royal Tiaras, my favourite is the Strathmore Rose Tiara which can be worn as more of a headpiece giving a vintage feel, it previously belonged to the Queen Mother as seen in this photo. 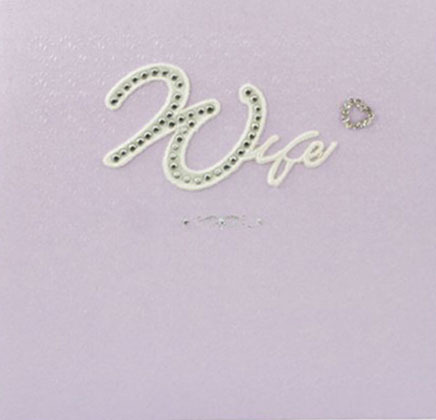 This pretty lilac pearlescent Wife Wedding Card is decorated with a diamante heart and makes the perfect first wife card you give to your partner when you’ve just become Mr & Mrs.
Can’t find a Wedding Post Box you like or to fit with your Wedding Theme? Make your own! 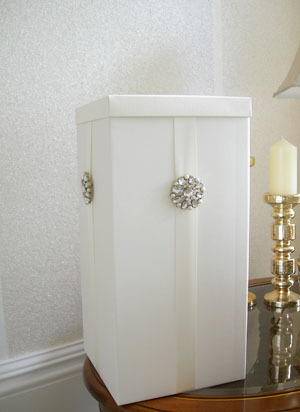 Buy a plain Ivory or White Post Box from eBay like this one, buy some wide ribbon in a colour to match your theme and decorate with a brooch on each side. 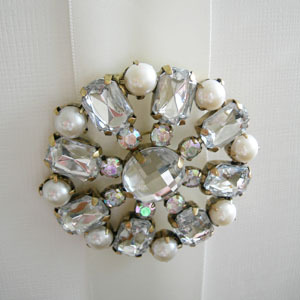 The larger the brooch the better. The ones pictured were bought from Primark and cost approx £2 each! Stuck for a Wedding Gift idea? 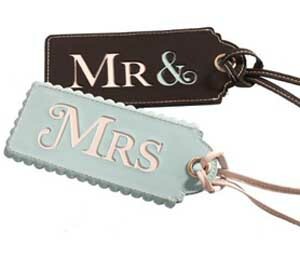 Send the happy couple off on their honeymoon in style with these fabulous Mr & Mrs luggage tags ~ an unusual gift for the Bride & Groom and a helpful hint for the airline staff to provide that coveted upgrade! 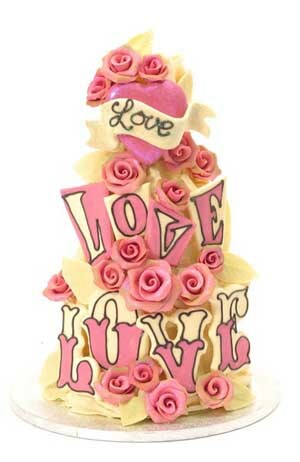 We just Love Love Love this 3 tiered pink & white chocolate Wedding Cake from Choccywoccydoodah. Perfect for a Valentines themed Wedding or just as a reminder of how much you love each other. Its so pretty, its a shame to cut it! 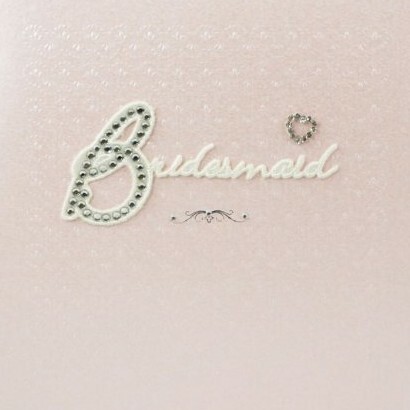 Say “Thank You” to your Bridesmaid in style with this pretty pink diamante bridesmaid card. 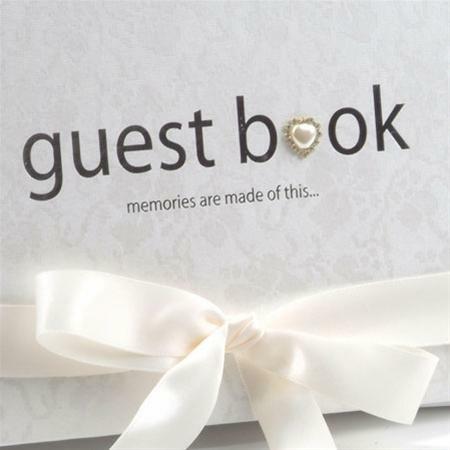 Treasure personal messages from your Wedding guests with this beautiful brocade, pearl and crystal detail guest book with hand-tied satin ribbon which also comes with a storage box to keep it in perfect condition.